Kim Dotcom, the founder of content-sharing site Megaupload, can legally be extradited to the US, New Zealand's High Court has ruled. 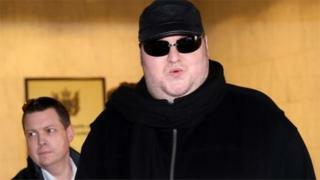 Dotcom is wanted by the US on a number of charges including fraud and copyright infringement. Three other Megaupload accused can also be extradited, the court said, upholding an earlier ruling in the District Court. The four have said they will appeal against the decision. Megaupload, which was shut down in 2012, allowed millions of people to download digital content, including films, music and TV shows. The High Court agreed with the defence that the accused could not be extradited on the basis of alleged copyright infringement, since "online communication of copyright protected works to the public is not a criminal offence in New Zealand". However they can be extradited on the fraud charges, he said, as they are crimes in New Zealand. The ruling does not determine the defendants' guilt or innocence, merely that they can be sent to the US for trial. Dotcom responded on Twitter, saying he had "won" as the ruling agreed he cannot be sent to the US for copyright infringement, but had "lost anyway", calling the ruling "a political judgement". "Judges who prioritize political views and career over impartiality and the law shouldn't be Judges at all," he said. Mr Dotcom and former colleagues - Mathias Ortmann, Bram van der Kolk and Finn Batato - are accused of copyright infringement, conspiracy, racketeering and money laundering. In 2005, Dotcom founded file-sharing website Megaupload.com in Hong Kong, used by millions to share movies, TV shows, pictures and songs. Dotcom was granted residency in New Zealand in 2010. He has been living in Auckland since then. In January 2012, US authorities shut down Megaupload.com and charged Dotcom with copyright infringement, racketeering and money laundering. New Zealand police raided his house at the request of the FBI. The US government began extradition proceedings that same year. The extradition hearing started in September 2015 in Auckland. On 23 December, an Auckland judge ruled he could be sent to the US to face charges. Dotcom, a German national living in New Zealand, has described himself as an "internet freedom fighter" engaged in a David and Goliath battle against major corporations. US authorities say Dotcom and others cost film studios and record companies more than $500m (£322m) in lost earnings, while making at least $175m for themselves.